The Other Boufs: Mommy, Daddy, Katie, Timmy ... and more! 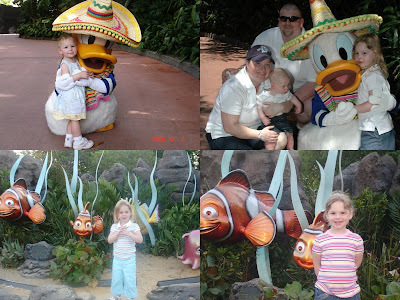 : Disney (Day 2) - Wrapping it Up! To recap, we started out our second day of vacation with a photo shoot at the Grand Floridian and breakfast at 1900 Park Fare. I wrote all about them here. 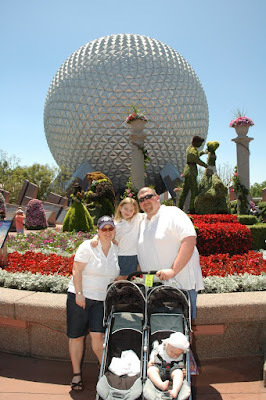 After the camera fiasco and having to go to lost and found, we finally made it to our first park, Epcot, at about 1pm. Tim's working off the long morning with a snooze. Epcot is really pretty in April because they have their Flower Festival and they have really cool flower displays, character themed shrubs/flowers, and some extra cool playgrounds there for the Festival. 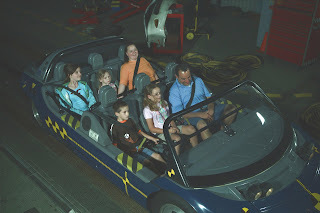 Katie and I started off by going to Spaceship Earth while Chris went to Test Track with Timmy to get us Fast Passes. A mellow/lame ride by Disney standards, but Katie got off of her first ride of the trip gushing that "It was a REALLY great ride." Actually, I was even pleasantly suprised. I missed this one last time around. Chris and Katie went alone for some reason and it was actually better than I remembered. They incorporated a fun little story/game at the end while you go down where you pick things that are most important in your life and they show you "future" machines that will help make your life easier. It's done in a cartoon manner and one of the characters was actually Katie's face. She loved that! Next we walked through the Fairy Garden (flower exhibit and playground) and headed over to Mexico to ride the boat ride. To say Timmy enjoyed the boat ride is putting it mildly. There were screens with sound staggered on both sides of the boat and he could not whip his head back and forth fast enough to take it all in. Then we headed out for a break. Chris took the kids straight back to the hotel. I brought the empty stroller (since Chris couldn't hold Timmy and fold up the stroller on his own) back to the Grand Floridian to get my freaking camera. Good times! Katie one year ago and Katie now. We got off the ride just in time for the fireworks at 9pm. This was another first for Katie. 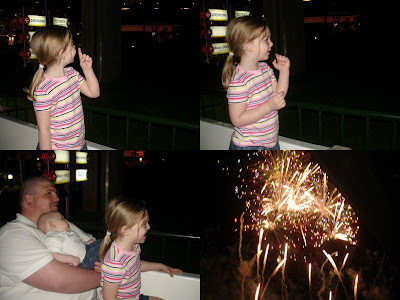 Her first trip we didn't even attempt any fireworks and last year we tried, but she was so tired she just freaked out...for the same reason she's never even gone to 4th of July fireworks...so this was her first time EVER seeing fireworks and she LOVED them!!! We didn't really see the water portion of the show because we stayed in Future World at the entrance to the World Showcase, but that worked out great because we raced to the buses and had NO wait to get back to the hotel. Day 3 (Thursday of our trip) is next...morning at Hollywood Studios with a Playhouse Disney breakfast and an evening at Fort Wilderness Campground. awwww what a great time you all have had ! I'm very jealous, have always wanted to go to disney, maybe one day i'll get to euro disney in France !